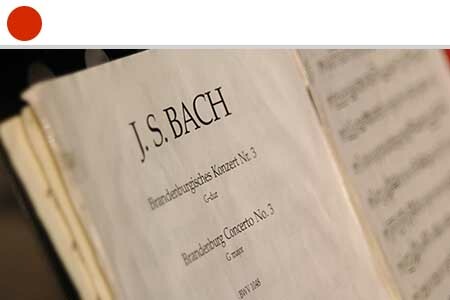 The If It Isn’t Baroque…The History of Western Music homeschool course begins with the study of music in ancient times in Egypt, Greece, Rome, etc., and progresses through Biblical times, Medieval times, the Renaissance, and modern music. 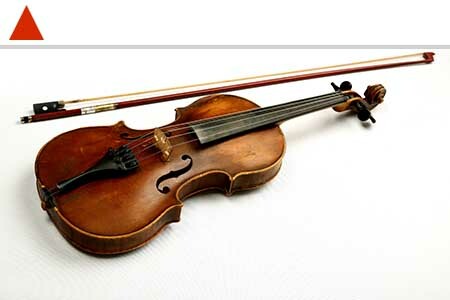 Explanations are provided to the homeschool student to differentiate the types of music, and instructions are given to make some of the instruments from ancient and Biblical times. 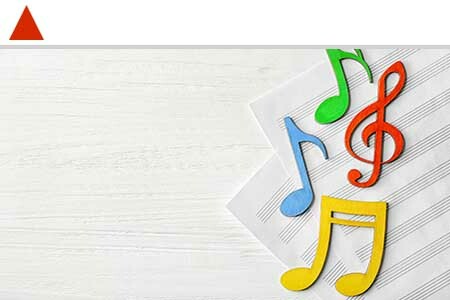 Lessons suggest listening activities for the various types of music and research activities for the homeschool student to explore them more deeply. 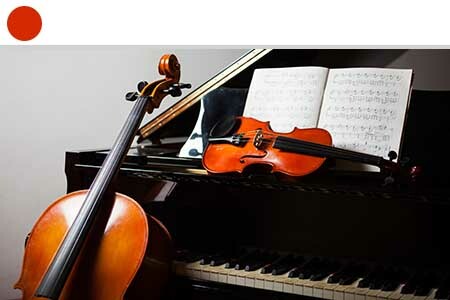 These homeschool music lessons should be studied in consecutive order, as they progress through time and therefore build on each other. 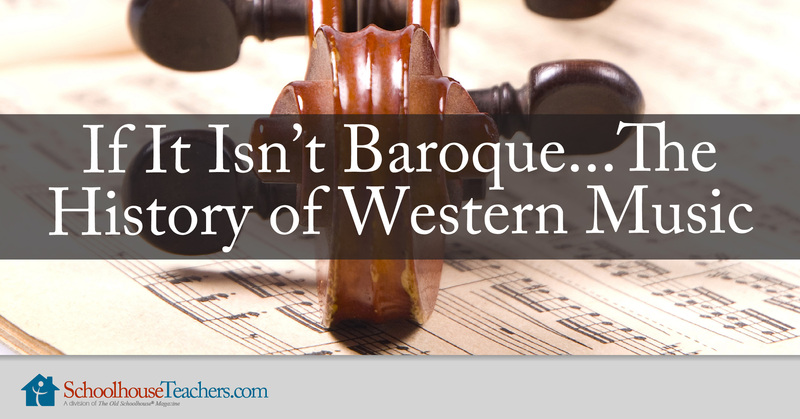 The If It Isn’t Baroque…The History of Western Music course may be taken independently of Music Theory I & II. Go to Class Lessons and download the lesson plan and course lessons file. Start with the Day 1 reading assignment. Follow the instructions each day on the lesson plan and check them off when completed. 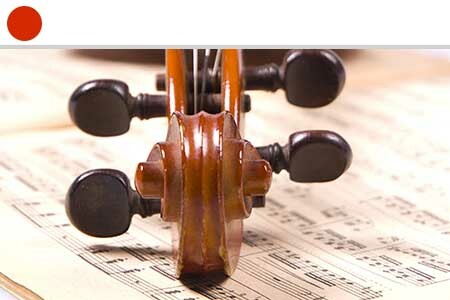 Twelve If It Isn’t Baroque…The History of Western Music homeschool lessons include listening assignments and hands-on activities for primary and secondary level homeschool students. 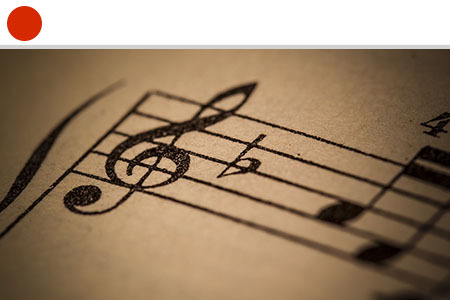 Lesson 1: When Did Music Begin? Lesson 12: Where Do We Go From Here? If It Isn’t Baroque . . . 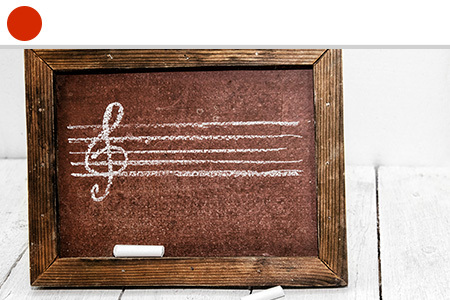 Lesson One—Where Did Music Begin? I remember watching a Disney short film called, Adventures in Music: Toot, Whistle, Plunk and Boom when I was a little girl. The animated short film was a light-hearted attempt to depict the origins of western music. Entertaining at best, this little film from 1953 does not do justice to the rich and amazing history of music. I believe that we are all born musical, but some need a bit more practice. 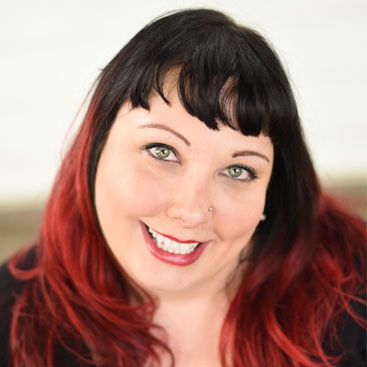 Music can truly connect us all as a people, and experiencing different genres and styles can open our minds to new cultures and ideas. That being said, I must state that there are a variety of scholars who have written articles, books, and papers regarding the origins of music. However, there does not seem to be a universal agreement as to the time or place music began. Some believe music was a response to sounds heard in nature. Others believe music was a form of communication. 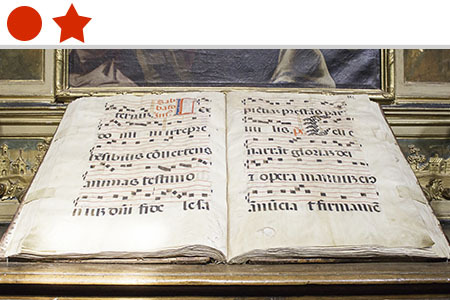 Some believe it had religious beginnings, and others think music was used for entertainment. However, for the purpose of this curriculum I will simply state that music began when mankind began. Even in small babies, the voice is used to communicate happiness, sadness, hunger, and frustration. 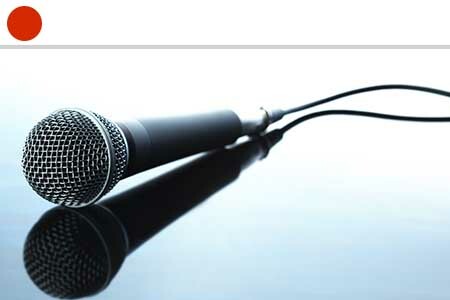 Thus, it is very likely that the voice itself was the first musical instrument. 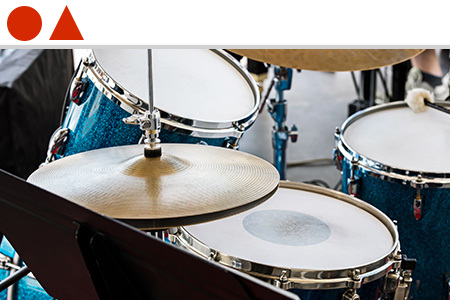 For those students who have not completed Music Theory I, or for those who simply need a reminder: percussion instruments are those one hits, shakes, or taps. Hands make excellent percussion instruments, and must have helped early people create basic rhythmic patterns. Rocks, sticks, and other objects could have been tapped together to create beats and different sounds. Dried fruit and/or vegetables could be shaken to make a maraca-like sound. Early people made primitive flutes, whistles, and pipes from bone or wood. Little holes could be carved into the bone in order to make different tones. Some early flutes had up to seven different tones that could be played. Triangular lutes or harps were made from strings or cords and were plucked. Even though there might be disagreement with when music began, we can still see primitive instruments used by indigenous groups of people today. Archeologists are able to use these instruments as a window to our past. Creating a simple instrument out of household supplies is really quite fun and, in many cases, free. While many options are available with a simple Google search, here are my two favorites from years of teaching. *Do not use a sharp knife without your parents’ permission or assistance. Remove any plastic that remains on tissue box. Sometimes there is some plastic left around the tissue exit hole, but it comes off quite easily. Cut a hole in the side of the box for the paper towel tube. You may want to use a pencil to draw around the tube, as well as a hobby knife to make a neat hole. Put the paper towel tube into the hole and push in a couple of inches. You can use glue or a hot glue gun to secure. If you use school glue make sure to let the instrument dry before the next step. Then decorate the tissue box and paper towel tube as you wish. Add the rubber bands, which will go lengthwise on the box. 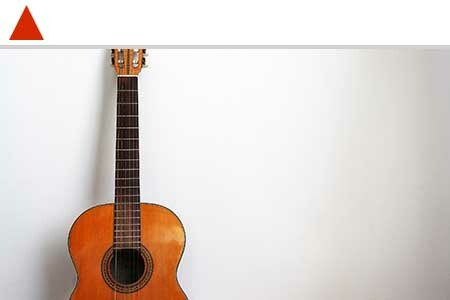 Now you are ready to strum away! *Do not use an awl or sharp cutting object without your parents’ permission or assistance. Invite your family and/or friends to hear your primitive music. Or, better yet, invite over a group of friends to make primitive instruments and then play together. 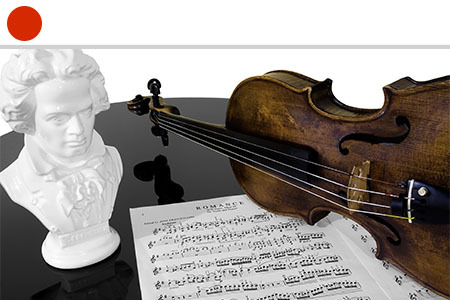 The If It Isn’t Baroque…The History of Western Music homeschool course tries to answer the question, “When did music begin?” and trace its journey through history until modern day. 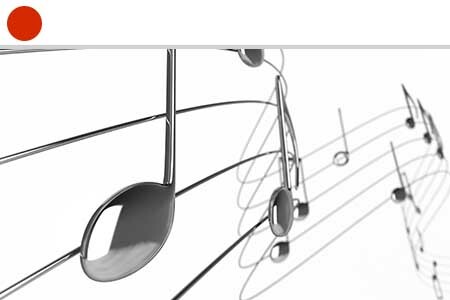 Through text-based lessons, construction and use of simple instruments, and challenge activities, homeschool students explore the progression of music from primitive instruments through contemporary popular music. A suggested reading list encourages homeschool students to further their study beyond course. Would you like to tell others about this If It Isn’t Baroque…The History of Western Music homeschool course?